What do you see when you look at this picture? Does this look like a wise place to build a castle? Do you think the builder foolish? Is the picture a newer perspective on the age old question; "is the glass half empty or half full?" What comes to mind? Jesus' teaching came to my mind when I first laid eyes on this photo. Though the castle seems to be set in a precarious position, I imagined that this castle has weathered countless storms over the years. 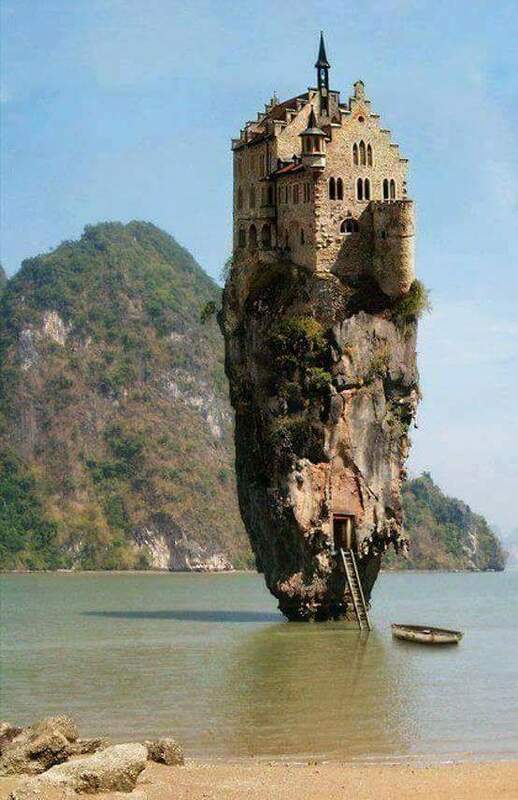 I can imagine the owner proclaiming with delight, "Thank you Lord; my castle is still standing" each and every time he/she cast eyes on it. Jesus says that everyone who hears his words and does them will be like the wise builder whose house withstands the storms of life. Our stewardship theme this year is The Joy of Giving! I know of no greater building material in life than the joy of giving.The Greek word for joy is chara and the Greek word for grace is chare; joy and grace are both gifts from God and when we share these gifts; i.e. do what Jesus says to do, the house/castle we build can withstand all life's storms. Gracious God, fill us with your gift of joy, so that as we share your grace with others, our faith will grow and our souls will be refreshed amidst our struggles. Amen.